We are here in beautiful Washington, D.C. visiting our daughter, and what a time to be in our nation’s capital! Each time we have driven by the Arlington Cemetery, we are reminded of the sacrifices many men and women have made for us. It is truly humbling. Always remember this day and every day. We are free to be who we are because of them. Paul, you are not kidding! 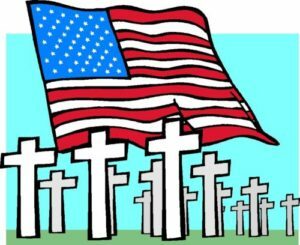 When we visited the cemeteries in both my husband’s and my hometowns, it was so wonderful to see that the Boy Scouts and Veterans had put up flags on all of the gravestones of those who served our country to insure all of our freedoms. I am in the process of writing a chapter in an upcoming text about the experience of women veterans who are (re)entering the classroom. Always reminds me of my dad, who like many other vets, post WWII, came home with a new skill and/or re-entered training for a new profession. There are so many now . . .
Jane, good luck with the text’s chapter. It sounds like an important chapter in the book. From a Veteran of Dessert Storm and Shield that did not get deployed but stayed here in the states , and her father, a WWII Okinawa Purple Heart, and Grandfather in the WWI army, We all say, You’re welcome. I’m glad that I served in the capacity (even though not front line) that I did. So again, I was happy to serve and make a contribution to others that served before me. I have a Navy Seal and 4 other cousins on both sides of the family as well as Uncles that served in the Marines (WWII) and Naval Reserves (same) and Great Uncles in the Civil War at Gettysburg (North). I only say this because I think that most families in this country have one or more service men and women in this and other generations that have made their contributions and sacrifices as well. We’ve all given one way or another, whether serving or having family and friends that served. That is what has made this country great. Best wishes to you all for your selves and families for this day and what it means to you. Rob, well put! And, thank you to you AND all of your loved ones! I want to thank you for this blogsite. I love it and it is so fun to read what others are reading and get more ideas to take to my library for my lists. I also want to add an author that i’ve recently discovered in the line of Laura Bradford-Amish mysteries by Isabelle Alan. Quilting mysteries are fun for me to read and other authors that write about crafts. Maggie Sefton is a favorite, Monica Ferris and Avery Aames to mention just a few that I’ve read and love. I accidentally stumbled upon your site and have been here happily ever since. Happy Memorial Day holiday for you and family. Rob, I’m glad you found the site and am happy you’re enjoying it! I live in Beaufort County SC proud home to USMCR Parris Island , MCAS Beaufort , a US Naval Hospital as well as a National Cemetery . I can hear the Marines when they are on the rifle range as well as jets flying overhead on any given day from my home. There is a sign at the entrance to the Air Station that says ” The Sound you hear is the sound of Freedom. ” I am so grateful for all who have served /serve. Denise, that is such a neat sign! So true!! !